As the nights are drawing closer, shooting days have been getting shorter. So how does a photographer, who primarily needs and uses light, be that natural or electric use their time efficiently during the winter? The answer is probably very clear- you either over-light everything OR turn in to a nocturnal creature chasing the stars and a clear sky. This year I am sure most of you (and all of you locals) have heard that the Brecon Beacons have been awarded Dark Skies Status. And after a beautiful clear summer, we are moving in to an equally clear autumn, which is great for stargazers of all experiences. Kids can stay up till 6 or 7pm and spot the Plough and for the keen astronomers, the night is seemingly endless with the sun rising around 7:50am. Around about now the sun goes down around 4pm, meaning that after this time, shooting in cottages becomes more difficult. 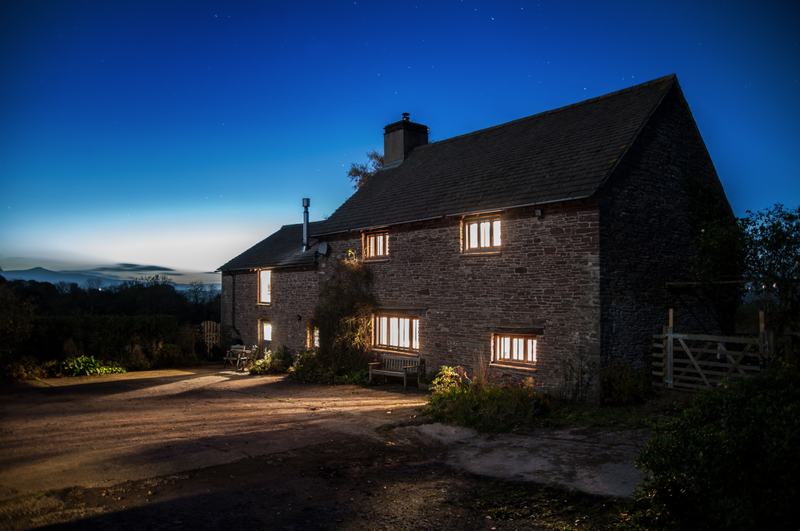 Recently we have been moving outside at this time to capture the cottages in dusk, while there is still enough natural light to play with and some stars are peeking out. 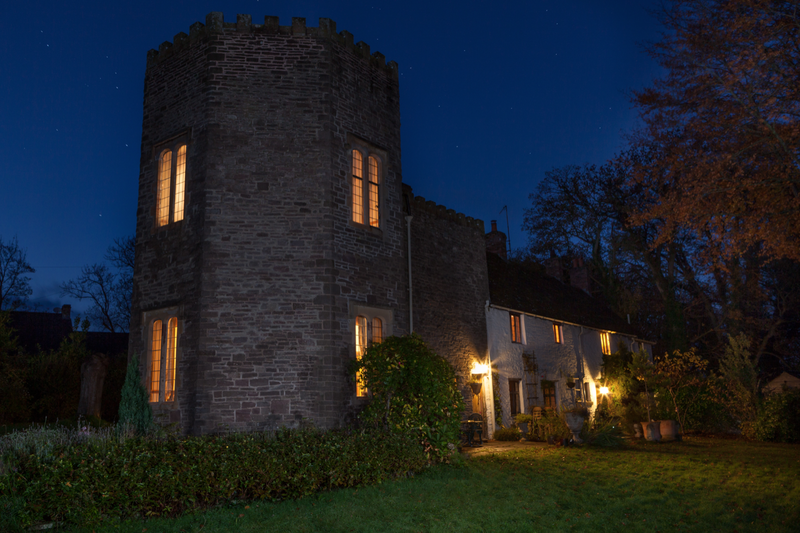 Some times we use flash to highlight the exterior of the building whilst still capturing the dark sky and its infinitude. So I pranced around in the dark with a high-powered electronic flash and a heavy battery (so heavy that my right arm now resembles Nadal’s serving arm), whilst trying to pop the light off with my big toe, standing on one leg reaching the light as high as my little arm could reach. Paul had the lucky job of holding down the button on the remote control and counting to 184 seconds. Which held the shutter open for long enough to take in most of the light in while not being too grainy by upping the sensitivity of “the film”. I had already tried this out at Trewalkin Fach a week or so earlier, minus Paul’s heavy external flash, and was really pleased with the results. The lights spill out on to the ground in front of the house and the glow of inside look so warm and welcoming. Jackie brought Ann (my assistant for the day who also works in the office) and I a cup of tea to warm our fingers up as mine had stopped working properly. Then a following evening I was on my way back from the pub and regretting not bringing my camera and tripod with me, as it had been such a beautiful clear night. So when I got home, I ran out the back and quickly set up a shot looking over to Tor-Y-Foel (Tora-Voil) Mountain, and in the distance Bwlch (Bool-ck- meaning the gap). If you want to experience the night sky in the Brecon Beacons there are quite a few events happening. 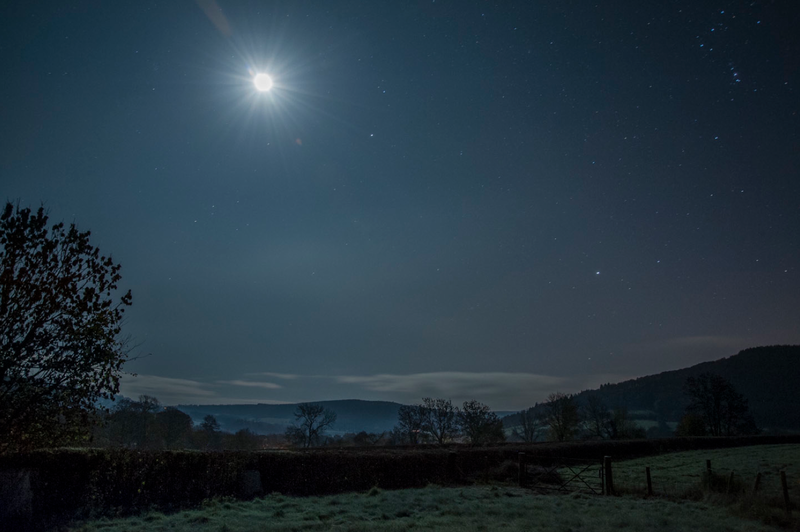 CAMRA Pub of the Year Winner, The Star Inn in Talybont this Friday (the 29th Nov) is hosting an event in conjunction with a planetarium down at Henderson Hall and a stargazing set up in the garden at the back of the pub. What could be better than drinking mulled wine and some stargazing? To find out more visit The Star Inn website.